Too many DIY projects? To-do list overwhelming? Here, author Beth Kendrick shares her top 10 de-stressing tips. Amid the whirlwind of those seemingly endless last-minute preparations, take time to relax and reflect on what matters most: friends, family, and of course, fun! Whether it’s a moment of Zen by your lonesome or happy hour with the girls, every bride needs a few strategies to step out of the spotlight and enjoy the moment. This entry was posted in Wedding Planning on November 19, 2013 by bridebuild. The star of WEtv’s “My Fair Wedding” shares his key wedding-planning dos and don’ts. A laid-back barbecue dinner is the colorful — and tasty — kickoff to a rustic weekend wedding. S’mores. Ping pong. Fresh pie. Those were just a few of the treats on offer at this welcome dinner in California wine country. And while the overall theme evoked carefree memories of summer camp, the décor was decidedly adult: a heady mix of country charm punctuated with luxe touches of crystal glassware and colorful blooms. Designer Sasha Souza of Sasha Souza Events shares all the gorgeous details. If you want your guests to rave about your wedding — and what bride doesn't? — the options are practically endless. Get inspired by these inventive tips. 1. 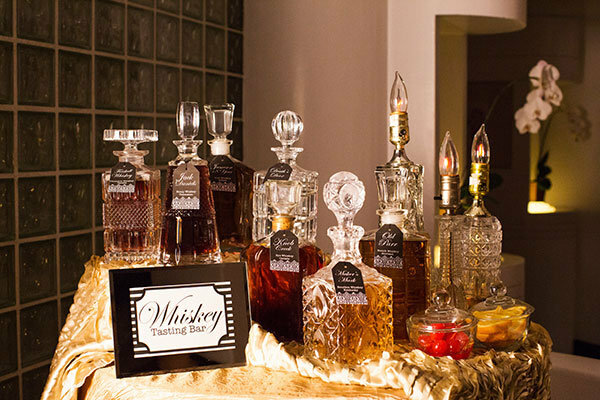 Make the cocktail hour interactive by setting up a wine, champagne or liquor tasting. A beverage expert or a sommelier can offer guests a sampling of libations and a little lesson on flavors. This entry was posted in Wedding Planning on November 12, 2013 by bridebuild. Ideal for a bachelorette weekend or other group getaway, take advantage of this special offer from the all-new, all-adult Breathless Resorts & Spas. Book five rooms, receive the sixth room free at Breathless Punta Cana Resort & Spa! every 10 rooms per night paid and $100 in resort coupons per person! This entry was posted in Destination Weddings on November 8, 2013 by bridebuild. With a bit of advance preparation and some savvy on-the-spot solutions, you’ll be prepared for any mishap that comes your way. The Oops: You or a sloppy guest spills red wine on your gown. The Fix: In a pinch, stain-removal wipes will work wonders on most dresses, says Mindy Weiss, a California-based event planner who has coordinated weddings for celebrity brides like Trista Rehn, Jessica Simpson and Gwen Stefani. “If you address the problem quickly, you'll have a better chance of getting the spot out completely,” advises John Mahdessian, President of Madame Paulette, a fabric-care specialist in New York City. He recommends the Madame Paulette Professional Stain Removal Kit (purchase it for $6 at madamepaulette.com), and swears it will remove any stain — from oil-based foundation makeup to red wine to tomato sauce — on any fabric within minutes. This entry was posted in Wedding Planning on November 8, 2013 by bridebuild. Interviewing potential vendors is like going on an awkward first date — you both hope there's chemistry, but it can be confusing to know exactly what to say. We asked top wedding experts to break down the most important questions that you should ask, to help you find the right vendor for your needs and budget. This entry was posted in Wedding Planning on November 4, 2013 by bridebuild.